For anyone out there who's a seasoned online dater (or, even relative newbies), we're sure you've had your fair share of bad dates. Either the guy's profile pic was a total bait-and-switch, or he turned out to be a complete, ahem, a-hole. If only there was a way to vet these dates first, because you know you're not the first one to get duped. Well, now there's an app for that. 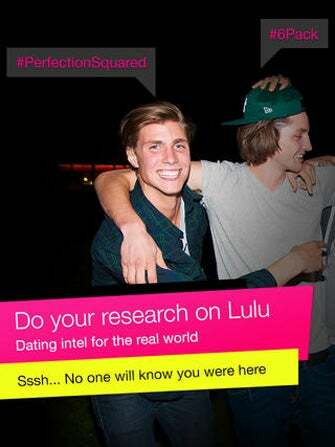 And, even better, it's not just about weeding out the bad dates — Lulu is dedicated to helping women invest in smarter, safer relationships. In short, the app harnesses the unending value of girl talk and brings it straight to your phone. The girls-only app synchs up with your Facebook account, and lets you read reviews of dates, or write your own post-date reviews. You can give input on everything from a guy's manner to his work ethic, and let other ladies know if you've found a diamond in the rough. Lulu also offers hilarious and brutally honest (and anonymous!) relationship advice from guys who are seasoned daters. It may not completely replace the locker-room chat at ladies' night, but it sure makes it a lot more convenient.